Are you sometimes surprised by your own strength? Sometimes you think your energy is zapped at the end of the workday. Then, the next thing you know, you're finishing off yard work or prepping meals for the whole week. Unfortunately, you most likely never prepared to fight the god of war with the Amazons. But if you're a Wonder Woman fan, you're probably inspired by her intensity and relentless attitude. If she had to train "five times harder or ten times harder" why shouldn't you try that in your own way? And while you're most likely not immortal like Dianna Prince, there's no need for the little clock on your cell phone to tell you what to do. And when it's not time to get up and fight, you can enjoy the little things like ice cream cones and dancing. All of these things, lead to you discovering a little more strength than you believed you had. This officially licensed dress is gorgeous with a maroon top with a gold eagle bodice that matches the go waist detail. The skirt has pleats to make fighting easier than ever. The red and gold boot toppers can strap onto whatever shoes you're most comfortable fighting in. The ensemble is topped off with gold and silver gauntlets, an armband, and the gold starred tiara. Wonder Woman has got some serious talent for taking down both gods and men. And yeah, we can't set you up with an actual lasso of truth or a shield that will throw off bullets. But you can take this look as far as you want with our gold lasso, shield, and sword. You can even team up with other members of the Justice League. 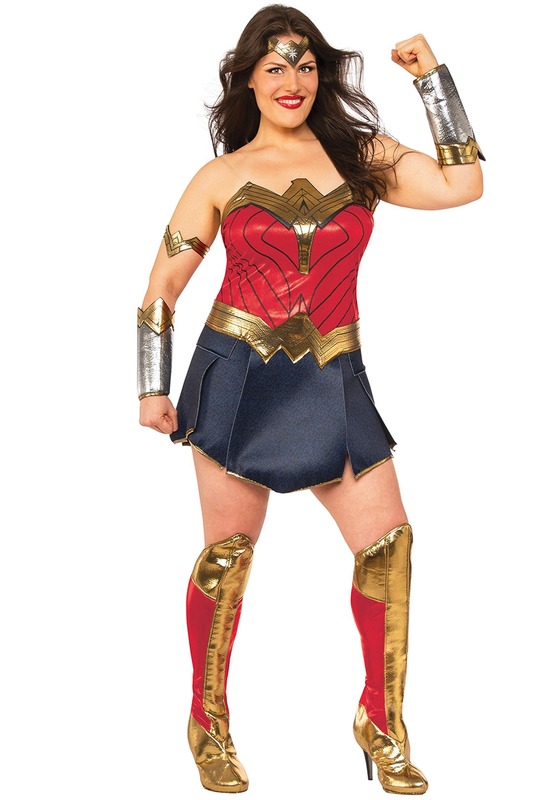 Whether you're heading out for Halloween, Comic-Con, or a superhero-themed party, you'll feel amazing when you're wearing this ensemble!